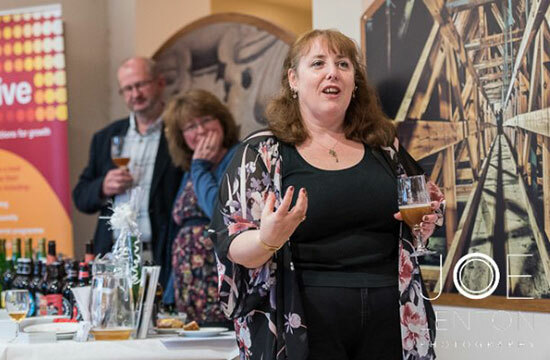 With a varied background of teaching and managing shops, it was Cheryl Cade’s love of beer which led her to set up her own business. Now in 2016, she is one of a limited number of Beer Sommeliers in the UK and raises a glass to her start up journey. The Thirst Consultants are Beer Sommeliers who offer tours, tastings and talks about beer. They also provide consultancy for breweries and public houses on how to additionally market beer to their clients, for example by matching it with food. Being one of very few Beer Sommeliers, I believe the strength of The Thirst Consultants is our adaptability in order to accommodate the requests of our clients. In addition, we can also supply and source beer for gift and events, such as beer festivals. I love history and the stories behind beers, breweries and the beer styles are something I enjoy talking about. I also like to help people discover new things and the world of beer helps me to do this. Having arranged tours for friends to Belgium for a number of years, I realised this was something I could incorporate into the business. The Thirst Consultants are one of only a few companies that provide fully accompanied tours, providing plenty of in depth knowledge for beer enthusiasts. Working with beer may sound like a dream job for many, but it has not been without some challenges. For me, the finance side of the business was difficult. It is hard to work out how to charge for your time and value yourself. Not being a brewer or a pub, it has been hard for people to understand what The Thirst Consultants offer. I have overcome these obstacles by spending time networking, explaining and a lot of trial and error. The results are now being seen. I have been a World Beer Awards and an International Beer Challenge Judge. The Thirst Consultants have won a Luxury Travel Guide award, and I have been invited to join the Beer Writers Guild. I have also started to write a book, and I write for some magazines. What are your future plans for The Thirst Consultants? My Business Advisor, Richard Voisey believes that The Thirst Consultants has real growth potential. I am aiming for the business to organically grow and ultimately reduce employment time as a teacher to go full time with the business. I initially wanted to set up a shop, it wasn’t until I met with Business Consultant Richard Voisey that I realised that a shop may not suit what I wanted to achieve with my business start-up. I discovered that running a shop would not have given us the flexibility that we needed to do everything that we have. I now work from home. You are on the start of a journey that can take you anywhere, just be ready for the occasional breakdown, but also celebrate the successes! Nwes made sure I did not make one very big mistake. I still recommend them to people who are looking to start a business.